We’d made many tree houses before, but this one was going to be the best yet. We’d seen part of the movie “Swiss Family Robinson” on the soundless home movie reel (you know, the kind that had actual reels!) and we’d seen the amazing treehouse Mr. Robinson had built. That’s what we wanted! Dad had given us access to the scrap lumber and scrap nails from his various projects. My brother and I had a “plan” of how we were going to build it – trap door and all to keep the tiger out! This one wasn’t going to be close to the house. We were big kids now – we were going bigger and further away! There was a path through the trees out behind the house; tractor width that Dad cleared out at some point. The forest was cool and dark, mostly leafy poplar trees with a sprinkle of spruce in between. The cows used that path as well, so we had to watch our step as we hauled stuff out to our spot. It wasn’t unusual to step in a “pie” or two and if you had flip flops on…. We selected four sturdy trees, poplar, that formed an almost square. Another first for our tree house building days: four walls instead of three! For days, my brother and I carried and hammered. Our little sisters helped where they could, but they lost interest in the process at regular intervals! We used the blue handled bow saw to cut up those rough boards. We “measured” with the tape sometimes, sometimes we just guessed. Dad’s heavy fiberglass hammer was occasionally out there with us, whenever we thought we could sneak it out there! Normally, we used the lighter hammer that was “ours”. We’d learned to create cross braces for our floor so the boards had something to hold onto, plus, it allowed us to create a square trap door in the middle of the floor. We built the floor and left that part open. The tricky part was keeping the boards at the door even. We got smart and lined up the edge to the hole and then cut off the overhang out there at the wall edge. The walls were easy – just kept adding boards on top of each other. For windows, we’d either line up shorter one to leave a space or we’d skip a board to leave a full wall length “firing” space (for keeping watch for potential pirate attacks). The trap door – well, that took a few attempts. Originally, we wanted the door to be on hinges and lift up, but that didn’t work without hinges! Then we had to build a frame that FIT in our not-exactly-exact hole. Plus, it needed to be safe enough to be part of the floor so that no one (a.k.a. little sister that would tell on us) would fall through! The roof…hmmm…tricky. The top of the walls were at least 15 feet above the ground. Also, we wanted it weather proof because this was the Swiss Family Robinson tree house you know! No access to shingles, but, we did have a couple old cut up tin barrels that Dad had used at on time on a pig shed or something. We built the slanted frame so the rain would run off (pretty smart, eh!?) and give us something to nail the tin too. We hauled those barrels out there, avoiding most cuts from the rusty metal – tetanus be damned. They were a lot heavier than we thought! We only managed to get one up there. Pulled and pushed with ropes and hands. That was enough for us! There was no way we were going to haul another one up there! We nailed it down and added boards in the open spaces. There, it was kinda waterproof! My sisters enjoys the next part: decorating our new house! There were bits of scrap carpet and we built “furniture” with scraps of lumber – stools and little tables. There was even a shelf that we built! We made a ladder that we could lift up when the trap door was closed. It had good days and bad days, nails were added when we needed them; even a new step or two when they broke. Each day as we worked, we’d take all the tools and nails back to the house and put them away at the end of the day. We’d be in big trouble if Dad found that we’d neglected taking care of our tools. All summer and the summers that followed we’d go out there and pretend we were the Swiss Family Robinson. Occasionally, we’d be under attack from pirates. We had weddings and I would sing all the songs I knew for the reception. Some summers, we’d build fences around the place (that the cows always knocked down) and pretend that we were the Wilderness Family. Indians would attack those days. We’d create tools and kitchen “utensils” with bark, grasses and twigs. Other stuff would get carried out there and then taken back to the house. Days and hours were spent in the coolness of our Swiss Family Robinson tree house. Inventing and imagining. Building and fixing. Then, one day, we didn’t go out there anymore. I don’t know when it happened. I just realized that we hadn’t been out to the fort anymore. Sometimes we’d walk past it and reminisce about those days. For many years, it stood empty and echoing; grasses growing tall, branches and boards falling down. Dad never tore it down. Then, another day, there were other kids out there. One, by himself for awhile until the others came along. Ones with brown eyes, some with blue; all that look a little like those 4 kids from those summers long ago. 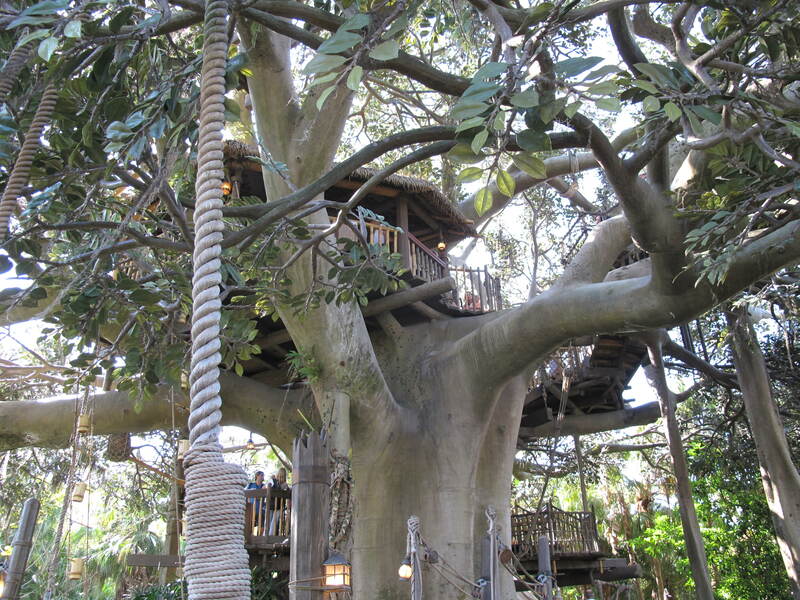 We saw the Swiss Family Robinson tree house at the Magic Kingdom and it took me back to those days. I write this story for my children and my nieces and nephews. May their imaginations soar! I, too, loved Swiss Family Robinson. Every kid needs a treehouse and needs to watch that movie – full of adventure and fun!